In the ten years since Rachel Simon first invited the world to board the bus with her and her sister, Cool Beth, readers across the globe have been moved by their story. Now, in an updated edition with fifty pages of new content, Rachel Simon reflects on changes in her life, Beth's life, and the lives of individuals with intellectual and developmental disabilities. The highlight is Beth's update, which is in her own words. A new Reader's Guide is also included. Join these two unforgettable sisters on their journey, this time in an even deeper and richer way. Rachel Simon's sister Beth is a spirited woman who lives intensely and often joyfully. Beth, who has an intellectual disability, spends her days riding the buses in her unnamed Pennsylvania city. The drivers, a lively group, are her mentors; her fellow passengers are her community. One day, Beth asks Rachel to accompany her on the buses for an entire year. This wise, funny, deeply affecting true story is the chronicle of that remarkable time. Rachel, a writer and college teacher whose hyperbusy life camouflaged her emotional isolation, had much to learn in her sister's extraordinary world. 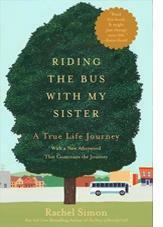 Full of life lessons from which any reader will profit, Riding the Bus with My Sister is "a heartwarming, life-affirming journey through both the present and the past...[that] might just change your life" (Boston Herald). Elegantly woven throughout the odyssey are riveting memories of terrifying maternal abandonment, fierce sisterly loyalty, and astonishing forgiveness. Rachel Simon brings to light the almost invisible world of adults with developmental disabilities, finds unlikely heroes in everyday life, and, without sentimentality, portrays Beth as the endearing, feisty, independent person she is. This heartwarming memoir about the unbreakable bond between two very different sisters takes the reader on an inspirational journey at once unique and universal. Riding the Bus with My Sister was made into a Hallmark Hall of Fame movie starring Rosie O'Donnell and Andie McDowell, and directed by Anjelica Huston.